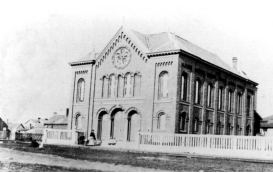 Explore Canada’s oldest synagogue (1863), Congregation Emanu-El (1461 Blanshard Street), the last standing brick building designed by the prolific Scottish architect, John Wright, in Romanesque Revival style. This sanctuary overflows with the vibrant history of its congregants, including the first Jewish Judge in Canada (Samuel Davies Schultz), the first Jewish mayor of any city in British North America (Lumley Franklin), and the first Jew to sit in the Canadian House of Commons (Henry Nathan Jr). Most tours will be led by Canada’s first ordained Maggidah (female Jewish storyteller), Shoshana Litman www.maggidah.com, who skillfully weaves local history and Jewish customs with tales both ancient and modern, highlighting the arrival of Victoria’s first Jews and the development of a dynamic congregation over 150 years to the present. Synagogue tours run on the hour, Wednesdays 12 to 3 p.m. and Thursdays 10 a.m. to 1 p.m., June through August, 2013. There will also be tours offered on Sundays at 8 p.m. in July and August. Cost is $10 per person and children under 12 are free. Reservations are not required. Please contact stories@maggidah.com or call 250-382-0615 to book a tour at another time or visit http://www.congregationemanu-el.ca/community/synagogue-tours/ for more information. For more pictures, please go to our Facebook Page.